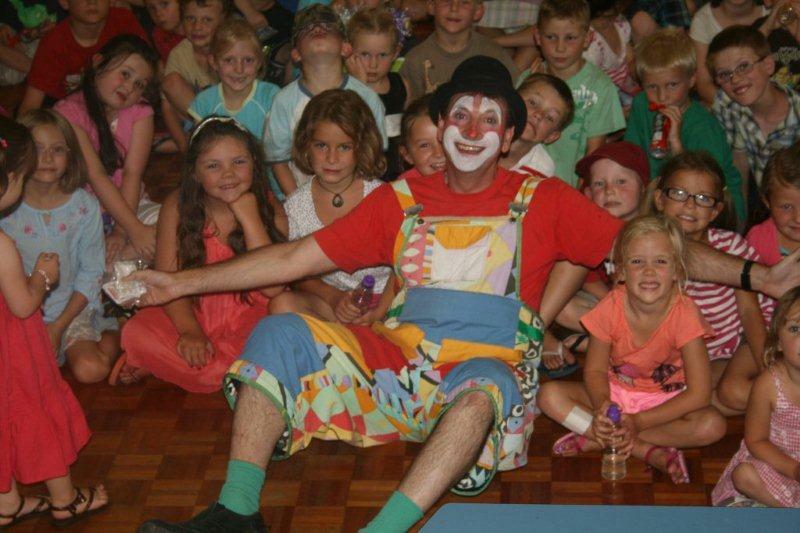 If Children's Happiness and Laughter are important to you Phone 0274339481 Cherry the Clown/Magician is called the Best entertaining, funniest Clown/Magician in Auckland! Special Promotion till October; $180.00 For a Magic and Juggling show as well as twisted balloons for up to 20 kids. Free Bubble Machine available for all bookings! Best Clown, Best Value Guaranteed! Entertaining NZ since 1991. For Kids Parties, Events, PreSchools, Schools, Malls and anywhere a professional Kids Entertainer is needed! From Private Children's Birthday Parties and Preschools to Malls and Major National and International Events, We provide the Best in Children's Entertainment; Guaranteed! Cherry is often told he is the best, funniest magical clown they have seen. Find out for your self. ﻿Children's entertainers for Birthday Parties, Preschools,Holiday programmes, Schools, Events and Malls﻿﻿. KID'S BIRTHDAY PARTY ENTERTAINMENT SPECIAL! $180 FOR 45 MINUTES. YOU GET A CLOWN MAGIC SHOW, JUGGLING SHOW, CLOWN COMEDY, FUNNY PUPPETS AND BALLOON ANIMALS FOR ALL THE KIDS...AND GREAT MEMORIES! Check out the video to see Your clown in action. 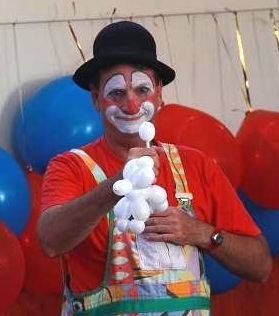 If you Have a Children's party or major Event coming up, make it great; Hire the funniest clown around! 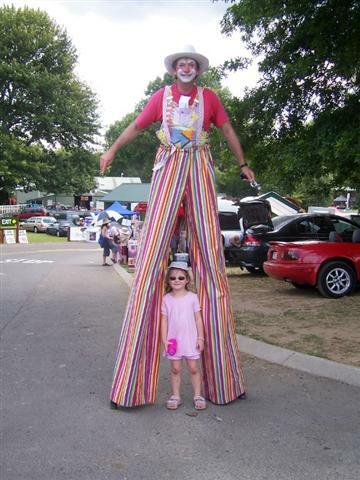 Here at Auckland Clowns we offer Kids Birthday party entertainers, Stilt walkers, Magicians, Animal balloons, Circus Acts, Clown Magic Shows and some of the Best Children's Entertainers in Auckland. We have a range of shows and entertainers suitable for all ages and events. 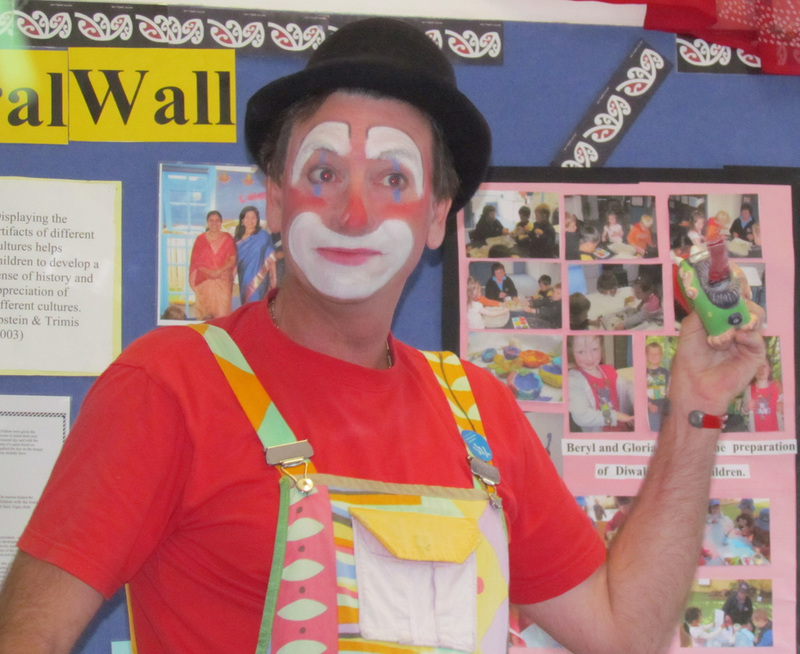 From Kids Birthdays, PreSchools, Schools to Malls and Major Events; Auckland Clowns can connect you with Entertainers best suited to your requirements. For over 30 years our performers have delivered the Best Children's Entertainers and Kids Entertainment Nationally and Internationally. 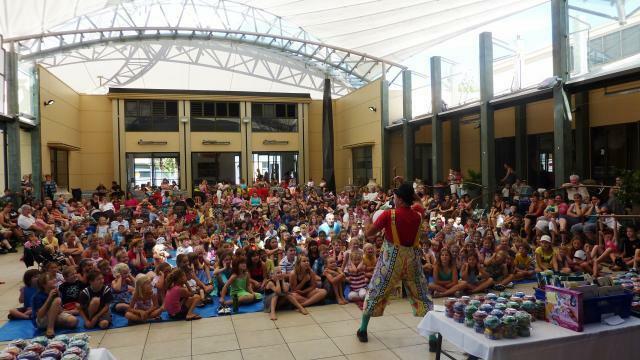 Auckland clown; Cherry the clown/magician is one of the best children's entertainers in Auckland and a true clown! He has performed all around NZ, Las Angeles, Sweden and Even was a regular performer at the Americas Cup. You will love his circus clown magic show. Cherry is available for Birthday Parties, Preschools, shopping Malls, Holiday Programs, Corporate Functions, Festivals, Christmas Parties and Libraries. If you are looking for a quality national and international reliable kids entertainer, with over 30 years of experience offering a money back guarantee...You have found him. Cherry is the ONLY Clown to offer this...because every one tells him he's the best, funniest clown they've seen. He has references longer than your arm...both arms! 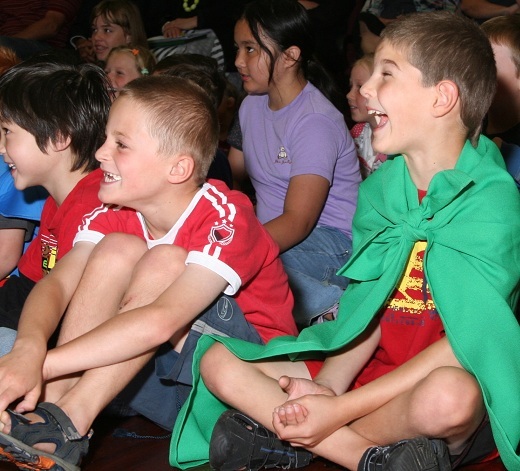 ​For the Best Kids party entertainers in Auckland. From Pre Schoolers to Pensioners. Auckland clown Cherry, The Funniest clown around! Cherry the clown is called the funniest clown around. With over 30 years experience performing nationally and internationally Cherry is a master clown. 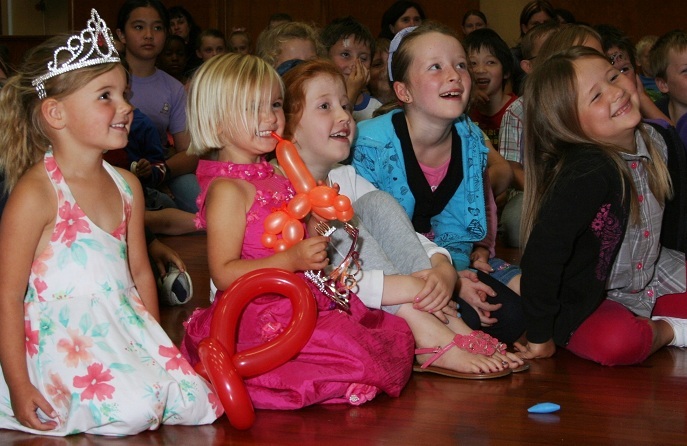 Auckland clown; Cherry Performs a 45-60minute show of pure comedy clown antics; Circus skills, Juggling, Comedy Magic show, Funny Puppets and Balloon Animals for all the kids. Cherry offers a money back guarantee; if you dont laugh you dont pay! Cherry is reliable, professional and a quality Children's entertainer; and thats no joke. 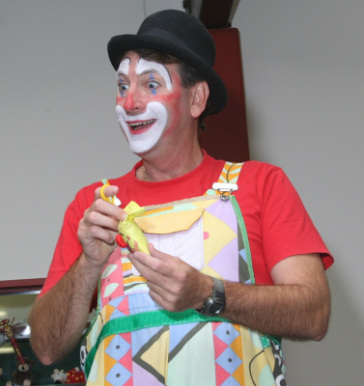 Great for birthday parties, events, preschools, store openings/ promotions, galas, educational shows...or where ever a REAL FUNNY CLOWN is needed If Cherry cant help we also have other clowns for hire. The best Children's entertainers in Auckland. All the kids enjoy Cherry's show. It is pure clown entertainment. The Kids faces say it all. Cherry is serious about his profession. 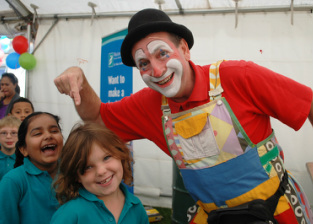 When living and performing in Europe; Cherry observed and learned from the best clowns; "funny" is the most important thing a clown should be"
“If you are looking for entertainment for a kids party, pre-school or large event; we at Auckland Clowns have a great range of children's entertainers to connect you with. 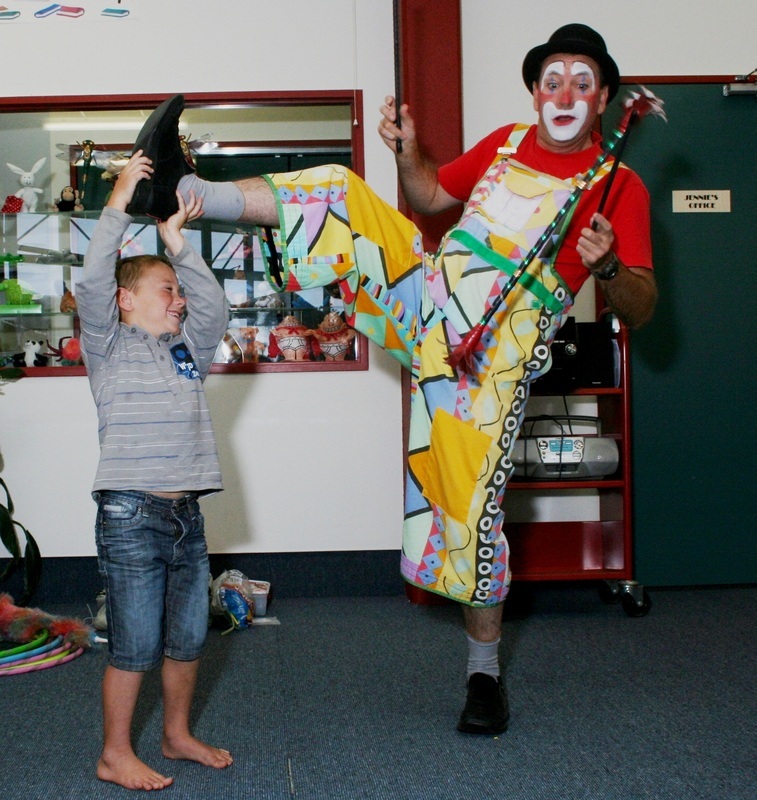 We have Clowns and Magicians ready to entertain at kid’s parties or events in most areas of Auckland. You can hire our many different children's entertainer options or let us suggest whats best suited for your child’s birthday party or Event. We offer Funny Magic shows from clowns, pirates and Unique Circus clown shows. If We cant help we; will put you in touch with other great Children's entertainers. Contact Auckland clowns for clowns, balloon twisters, stilt walkers, magicians for kids birthday parties, Christmas parties and events. The one stop shop for clowns for hire in Auckland. We also offer face painters for face painting and body painting. Cheap clowns but not Cheap acts! The best Auckland clowns around. We have Clowns for hire Auckland, Balloon twister’s Auckland, Conference entertainment Auckland, Pirates Auckland, Face painters Auckland, Clowns Auckland, Street performers Auckland, Street performers NZ, Stilt walkers Auckland, Children’s entertainment Auckland, Singing telegrams Auckland, Singing telegram hire, human statue hire, Clowns for hire, Auckland clowns, Auckland clowns for hire, birthday party entertainers Auckland. Birthday party entertainers Auckland, Kids Entertainers, Children's entertainers Auckland, Performers, Animal Balloons for Parties, Birthday Party, Auckland Entertainers, Circus performers NZ, Circus Shows, Auckland birthday Party Clowns, Birthday party entertainers Auckland, Clowns for birthday parties Auckland, Children’s Birthday party entertainers in Auckland, Birthday party Kid's Entertainers Auckland, Birthday party clowns Auckland, Children's Entertainment Auckland, Stilt walkers Auckland, Stilt walkers, Stilt walkers NZ, Auckland clowns for hire Auckland, Butlers for events, butlers for hire, funny clowns, Events, Kid's entertainment Auckland, Auckland Christmas Staff parties, Auckland birthday party, Kids Parties, Kid's birthday party entertainers Auckland, Kid's Entertainers, Auckland clowns for birthday parties, Circus Acts, Circus acts Auckland, Birthday Party Pirates Auckland, Clowns for kids parties, Auckland Pirates, Face painters Auckland, stilt walker, stilt walkers, street performers Auckland, Balloon Sculptures Auckland, Balloon animal twisters Auckland, street entertainers, Buskers, Entertainment for Christmas parties, Balloon Animals Auckland, Kids Party Entertainers Auckland, Auckland face painters for hire, Face painting Auckland, Face painters Auckland, Birthday party Clowns Auckland, Pirate Birthday party, Magicians for Birthdays, Birthday party clowns magic entertainment, jugglers. Auckland, North Shore, Manukau, Albany, Takapuna, New Market, Henderson, Parnell, Ponsonby, pukekohe , Papakura, Beachlands, Howick, Rodney, Waitekere, Central Auckland, Franklin North Auckland, South Auckland, East Auckland, West Auckland, West Auckland.